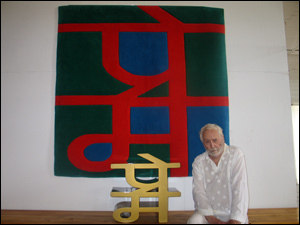 Gilbert claims Indiana signed an August 2007 agreement to license his iconic square logo for sculptures and tapestries bearing the word “prem” — Sanskrit for “love” — in both Sanskrit and English. Gilbert’s Manhattan federal-court suit seeks unspecified damages for breach of contract and unjust enrichment, along with an order barring Indiana from interfering with any future sales. Indiana counter-sued, seeking all profits from the sales of “English Prem,” as well as unspecified damages for alleged violations of trademark law and the Visual Artists Rights Act (“VARA”). Indiana also wants the Court to stop Gilbert from making “false statements” on Gilbert’s website. Both Gilbert and Indiana are to meet in the lovely state of Maine this month to try and settle this out. Good luck! New York Post story here. This entry was posted on Monday, April 5th, 2010 at 4:16 pm	and is filed under Contracts, Trademark. You can follow any responses to this entry through the RSS 2.0 feed. You can leave a response, or trackback from your own site.